"The epitome of volcanic wine"
"Mt. Tehama Shiraz (another base hit)"
August 1st, 2014 ushered in the new Manton Valley AVA (American Viticultural Area) to the United States system. This remote 9,800 acre AVA is found in a highly volcanic region of Northern California and features just a few wineries and 200 acres of existing vineyards. 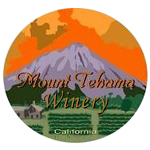 Copyright © Mt Tehama Winery. All Rights Reserved.